﻿ Daluyon Beach and Mountain Resort, Palawan | FROM $102 - SAVE ON AGODA! "PROS: Staff were very polite and nice." 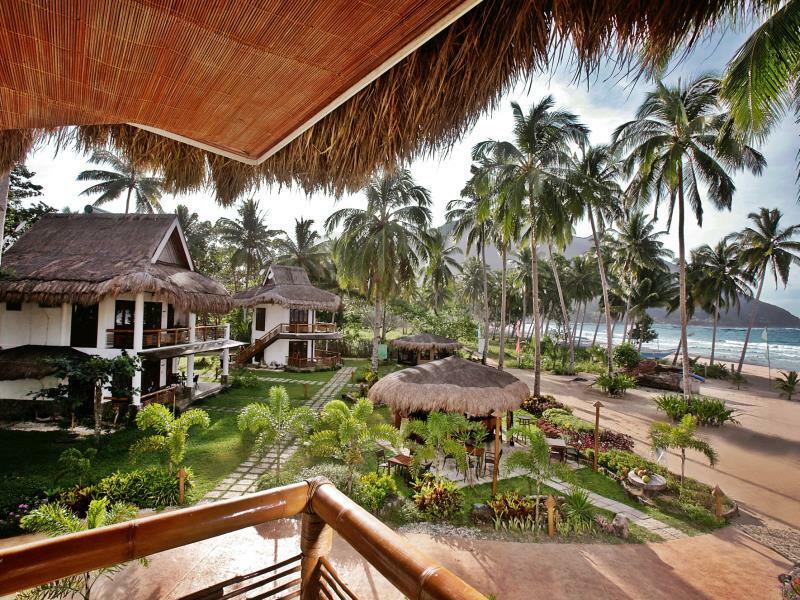 Have a question for Daluyon Beach and Mountain Resort? "Alvin at the pool bar was very accommodating and provided great service." "Very nice front beach view." "It is our first time here and it was an amazing experience." Travelers will find Daluyon Beach and Mountain Resort a strategic vacation spot with its world-class facilities and services, delicious local-international cuisine, and natural beauty. It is a leisurely walk to Sabang Pier, the gateway to the world-renowned UNESCO site, and one of the New 7 Wonders of Nature, the Puerto Princesa Underground River. A few minutes away is a mangrove park and an exciting zip line ride. 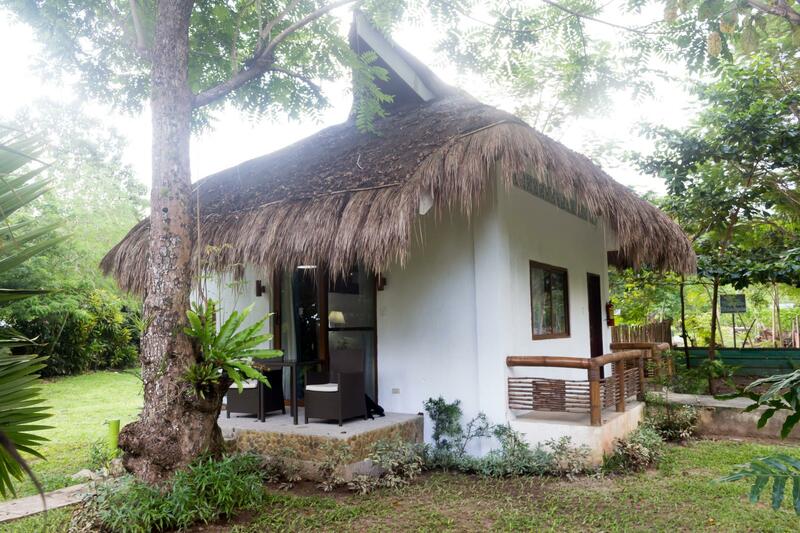 Visits to nearby attractions like bird watching, Ugong Rock, Lion’s Cave in St. Paul, the Crocodile Farm, Baker’s Field, Honda Bay, and souvenir shopping spots can easily be arranged. 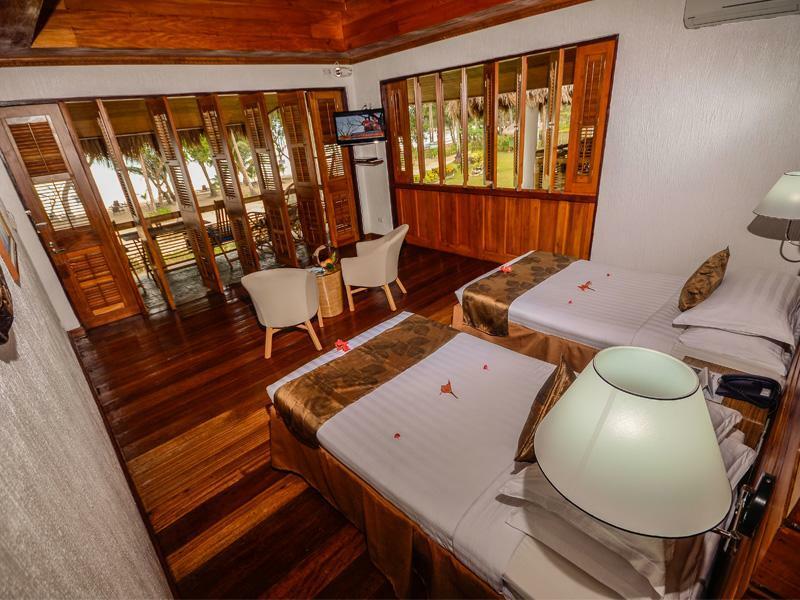 Guests may book any of the 27 cabanas, all of which include magnificent views facing the sea and quick access to the beachfront. All day you can enjoy the relaxing atmosphere of the resort with massage huts, a games room, chemical-free swimming pools, and so much more. Discover your paradise that blends excellent facilities and services with the beauty and serenity of nature at Daluyon Beach and Mountain Resort. "Staff was great and very attentive." Children aged 3 - 6 years old will be charged 50% of an adult price. Extra fee will be collected at the property. I had to attend a wedding in Palawan, and the only remaining hotel was Daluyon. I was reading some bad reviews (one rather scathing) and I was wary to book, but had no choice. But, we were PLEASANTLY SUPRISED with Daluyon! When we arrived, they practiced real service — offering us an available room even though it was too early to check in! That was super thoughtful. They thought of their customers and not about sticking to a policy for policy’s sake! The service was superb! All service can speak good english and all are so warm and accomodating! And the food was so much better! (i stayed here 4-6 years ago. That time, i dreaded the food and we ate in a diff resort every meal. This time, we ate at least half of our meals in daluyon. :) Lastly, Daluyon has the best aesthetics. Sheridan is too “hotel like”. 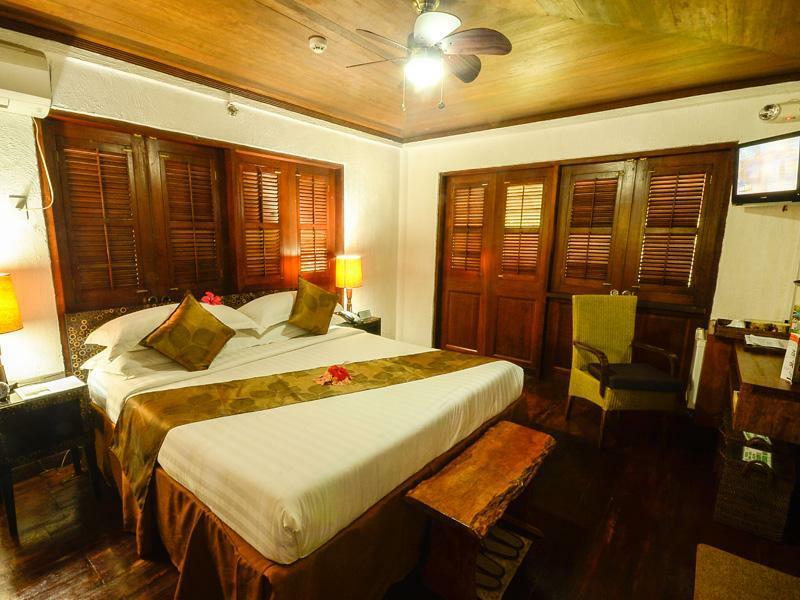 Daluyon gives comfort, luxury and one-ness with nature. Not to mention it has the best beach front. Am all raves, but not biased. They have minorpoints to improve on. We found this resort to tick all of the boxes - good food (and cocktails), quiet, full of things to do in and around the resort and friendly, attentive staff. No major gripes that we could think of at all. Would definitely recommend Daluyon and would definitely stay here again! We really loved our stay at Daluyon. The hotel grounds and setting on the beach are amazing. Food was pretty good. Staff were excellent. The rooms were wonderful, loved the space, design, and concern for the environment in many ways. I loved everything about our stay here. Waking up and walking directly onto the beach was just bliss. The staff were wonderful, dinner under the stars on the beach was amazing and the grounds were so relaxing and beautiful. My only wish was that we had the time to stay longer. I hope to go back one day. What a wonderful place! We only had a couple of nights and didn't get to avail ourselves of all of the fun daytime activities on the resort and off. Loved our breezy room, comfortable bed, decent shower, and wished I had more time to sit by the pool. Breakfast buffet had something for everybody, but the chef might consider studying a bit and up the game. Wanted a quick getaway to Palawan but didnt want to spend so much time traveling to El Nido. I flipped flop a few times between Daluyon and the Sheraton. It ultimately went with Daluyon. I was very pleased with my decision. The staff were more than pleasant and helpful for my car bookings. This includes the dilemma of my girlfriend friends flight getting delayed. The resort was very clean, beach villa was very nice and cosy, the restaurant was good. Breakfast always had a great variety of options and was tasty. I had dinner at the restaurant once and enjoyed it but also tried other nearby options. They were tasty and cheaper. Massages were also cheaper outside The pool is nice but I spent most of the time on the beautiful beach. Beware, there were signs for sand fleas and also huge sand wasps before you hit the main beach but did not bother us. I definitely would return as I was very pleased with my stay. It was a great, relaxing and romantic getaway. Id like to commend the staff. We had a few miscommunications w reservations and a billong error, but all were corrected and they did so with grace. Eco-friendly, family friendly and absolutely gorgeous. They also made us feel extra special as returning guests with subtle touces (flowers arranged in our room, canapés for dinner, warm smiles). This was our second stay in the past 2 weeks. Needless to say we loved staying here. Right next door to fantastic natural wonders, beautiful cottages and warm and welcoming staff. They even made a special flower arrangement in our room for our second arrival "Welcome home". We will certainly return to Daluyon, our home away from home. Nice location right at the beach. No gym, even if it says so in the description. Sure the building for the gym is there but itis empty. Food in the restaurant is good but a little pricey for what u get(small portions). Bfast is set meals, quite small portions. Nice staff. As always in the Philippines lack of maintenance of the whole resort. It was a beautiful spot. My balcony overlooked the beach. The room was large and had everything I needed. The staff were very friendly and polite. The food was a bit pricey. But good quality. The only downsides were that I got a lot of insect bites. Even though I wore repellant. I'm not sure if I got them at the beach or in my room or maybe at breakfast. I guess being an eco resort they don't spray pesticides on the gardens like most resorts in Asia. I also found the noisy cockerels that live near the hotel very annoying. They'd start their cockle-doodle-doing at 3am and continue intermittently throughout the day until 9pm. Sometimes it drove me nuts when I was trying to have a peaceful moment reading on my balcony. For this reason I probably wouldn't go back there. As I like peace and quiet! However my room was almost the furthest one from reception. If your room was nearer reception, further away from the chickens. It may not be a problem. We had a wonderful stay at Daluyon. Room was fantastic with sea views and the gentle sounds of the small waves. Staff were always great and always helpful. The beach, facilities, room and restaurant were perfect for us. Location: 2-hour shuttle/van ride from PPS airport. After the tiring flight delay from Manila, we were surprised of the tranquility of the place and the huge size rooms and the facilities. Staffs: The staffs are so courteous and they even gave us above and beyond assistance. To the front desks, resto staffs, transport drivers and to the maintenance people, thank you for giving us an exceptional service during our stay. Value for money: Worth what we paid for. Food: Although the resto's food prices are quite expensive, the food are tasty with large servings. There are lots of food to choose for the free breakfast buffet. The beach: One of our fave beaches. The beach is so very clean, with crystal turquoise water and very fine mocha sand. 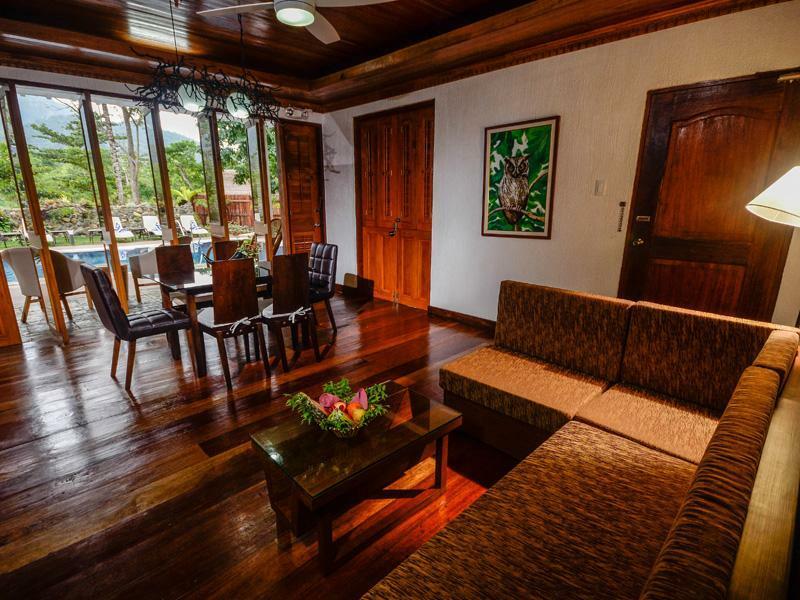 We will definitely consider to stay again in Daluyon Resort! Tips: If you're on a budget, there are cheap carinderias (eateries) along the Sabang national road which is 10 minute walk from the resort. You can also watch the entertainment every weekends along the shore at the Sheridan resort for free! Enjoy your stay! The beach is perfect! The hotel management were very good. Power and signal must be improve to entice more tourist. Location is most accessible to the Underground River, one of the world's 7 new wonders of this new generation.... truly amazing and Philippines 'must see' nature's work and an all-time pride before the world! Perfect place for a romantic getaway! Although it's far away from Puerto Princesa city centre, it's situation right next to the Subterranean River, so if you're interested in visiting the underground over and want some quiet time away from the rest of the tourists, this is the perfect place. 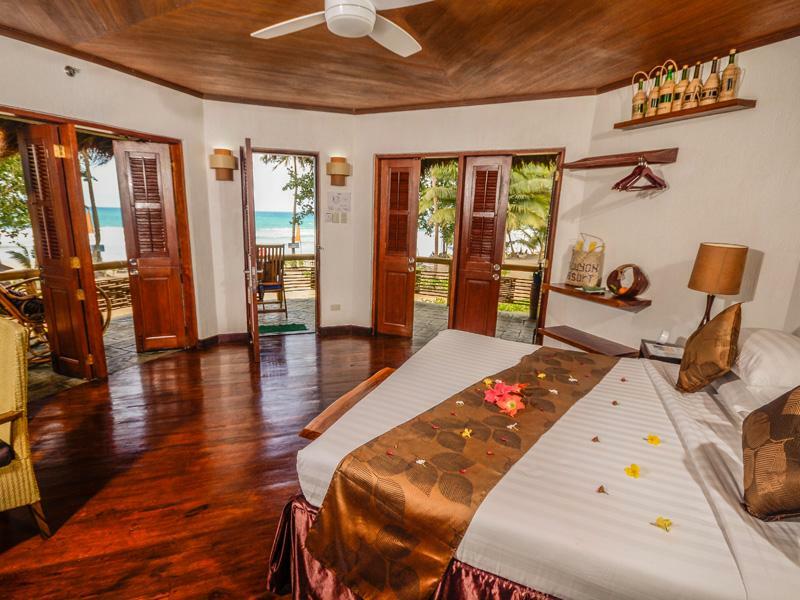 All the villas have ocean view, and the cute traditional touch and eco-conscious make this place unique. Will definitely go back again. We enjoyed our stay here, which really should have been longer, so we could have enjoyed the Pool, the Beach and the Pool bar for a 2nd night. We booked our tour through the resort. The restaurant is good as well. Tip: Underground river tour and walk the Jungle Trail at least one way. It's 1.5 hours trekking through beautiful primary forest. We saw wild monkeys. The trail is well maintained. It really should be better promoted, since only few people option to walk. If you want to get away from the crowds and relax in one of the most amazing places on earth, then stay at the Daluyon Resort. Arriving in the dark through the rainforest we had no clue of what surrounded us until sunrise, and what a surprise. The units are great, the staff very friendly and helpful and the location has to be seen to believed. Our stay was over way too soon. Great place to stay. Nice beach and good facilities and very close to the underground cave. Food and service at the restaurant was tolerable but could have been much better for the price. Wifi only available in public areas. I would stay here again.